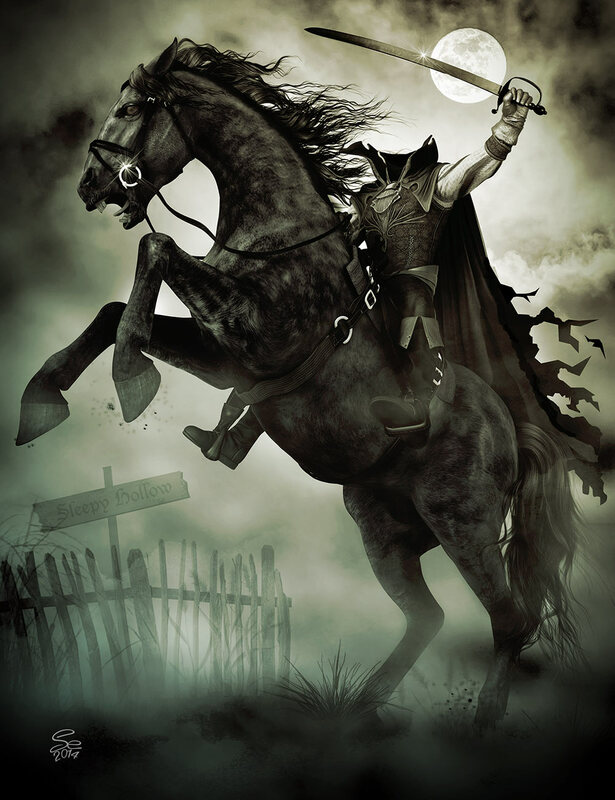 I’ve been wanting to do a traditional Headless Horseman theme for a while now and since it’s finally October, it seemed like a perfect time. I was also dying to try out the new Daz 2 Horse on something, (which is super detailed and you pretty much cant do anything that doesn’t look awesome with it, btw) so I cranked this one out. I couldn’t find a color scheme I was happy with so I settled for b&w, which looks cool too, so I just went with it. I was never a big fan of DAZStudio up until now. I’ll have to admit that once you get the hang of things, it works really well when using DAZ only models. The parameters are really responsive and work quickly, as opposed to Poser, which sometimes they work, sometimes they don’t, sometimes you just turn a dial and wait… also DAZStudio always seems to me to render with this sort of crispy, kind of chalky, brushed aluminum effect, so doing something with this kind of grainy look works really well. I ended up just buying some light sets because I’m still a bit shaky with the UI, but once you mess with it a bit, things go really quickly as far a workflow. I spend a lot of time fixing things in Poser and with DAZStudio it seems to just let you get done, which I am a huge fan of.